"What? Where? When?" The short answer is that it is a Roman period bath (dated to the fourth century CE) discovered on the North Tel in the mid-1990s. Excavation of the bath uncovered the furnace, hypocaust tunnels which supported a partially preserved floor and two chambers. The scene depicted in the picture is a group of Romans hanging around in their togas as they relax at the bath. Ok, truth be told it is some volunteers engaged in a re-enactment for the benefit of other volunteers on a Tel tour, a once a week opportunity to visit other excavation areas and learn about what is being discovered. For bonus points, where exactly is the bath located on the North Tel? And can you name one of the two supervisors of this area? I found this article while procrastinating on some work and include a link to it here as an introduction to Dr. Daniel Master, co-director of the Leon Levy Expedition to Ashkelon. The story is a familiar one as my road to Ashkelon parallels that of Daniel’s to a great extent with some obvious differences (he is a co-director and I am not for example). My freshman year of college my roommate was an anthropology major which I thought was cool though less practical then my history major. Sure Indiana Jones had lots of great adventures but really, who would pay you to do that sort of work? I wasn’t convinced there were too many people that would. I was, however, more easily convinced that it would be fun to try an archaeological excavation, that spending a summer digging in the dirt under a blazing hot sun would be a great experience. So, like many students before me I perused the help-wanted ads in Archaeology Magazine and Biblical Archaeology Review. In other words, I combed through their annual listings of excavations that take student volunteers and chose one at random. Ashkelon was the winner. I suppose the Harvard University name attached to it may have had something to do with my choice but I really don’t remember. What I do remember is that once the idea hit me I didn’t let it go until I found myself in Ashkelon several months later. I liked it enough that first season that I returned a second season as a volunteer happy to pay for the privilege of once again wallowing in the sewers of Ashkelon. My hard work, enthusiasm and willingness to dig just about anything paid off and I was invited back as an assistant square supervisor for the 1991 field season. In those days Ashkelon was huge. On average 80 to 120 volunteers and a staff of 50 to 60 people. The excavation was large not just in terms of numbers but also in numbers of areas being worked. Each excavation had a Grid Supervisor, the person in charge of directing, collating, processing and interpreting the data collected from however many 10 x 10 meter squares were opened for excavation within that grid. Each square, of course, had a Square Supervisor who was responsible for the day to day decisions within that square. And it was not unheard of for each square to have an assistant supervisor who, obviously, assisted the Square Supervisor while receiving the training with which to overthrow their bosses. Such was my position in 1991 when not even a week into the season I was promoted, without any overthrowing required, to a Square Supervisor in Grid 50 where I stayed for many years. I even made the cover of BAR one year -- of course, the scenic excavation area overlooking the Mediterranean Sea undoubtedly had more to do with that than I did. And maybe along the way the power went to my head because I decided archaeology really was cool and that it didn’t matter it was less practical than history (remember, I was young then and I liked to study history). I decided graduate school was the way to go but I wouldn’t do what it seemed like everyone else at Ashkelon was doing. No Bronze or Iron Age archaeology for me. No, I decided that I wanted to study the late periods, specifically the Islamic period. This proved to be a very fortuitous decision as I was able to write about Ashkelon for my dissertation. No one else wanted to do it and I had my choice of topics. I continued digging at Ashkelon throughout graduate school and in 1997 I became a Grid Supervisor and had the privilege of opening a new area for excavation. Next it was on to a stint as the Ashkelon Lab Director for which I am most well-known as the author of an unheralded but very amusing (I am told) Lab Director’s Manual. 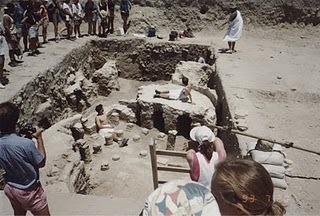 The Leon Levy Expedition to Ashkelon maintains a lab facility year round in the city of Ashkelon in order to facilitate research and other ongoing projects associated with the excavation. That can mean anything from moving pottery crates from one rat-infested warehouse to another, hosting visiting scholars or team members working on various research projects to supervising, shall we say, the delicate use of mechanized equipment to prepare for the upcoming season of excavation. A varied and demanding job it is nonetheless quite rewarding and puts you in near proximity to some amazing archaeological discoveries on a daily basis. In 2008 I went back to serving as a Grid Supervisor and there I have stayed. Every year there are new problems, fresh faces and the opportunity not only to uncover the history of Ashkelon but also to teach the next generation of archaeologists who will pursue our dream of revealing and interpreting the material remains of this ancient city. How will your Ashkelon story read? And now for the next installment of “What, Where, When?” Thoughts?